GPS (Global Positioning System) has changed everything in survey. For professionals in this field Solarnetics, has little to offer. However there are problems like expensive equipment and transporting it into remote locations. 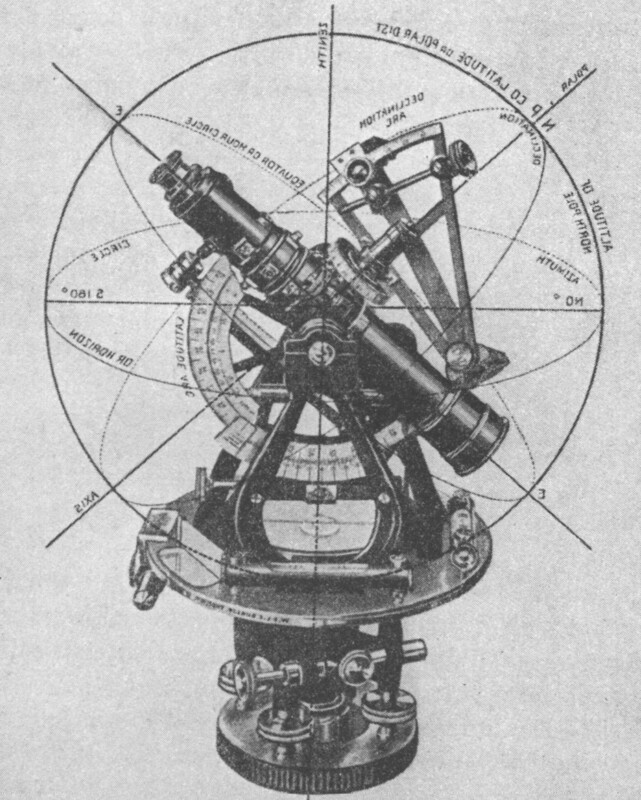 When using SHAMOS for astronomical survey a very old transit in good condition is adequate to the accuracy level of the transit used. When using a Sokkia DT5A digital transit accurate to 5 arc seconds and measuring the position of Venus, I have seen SHAMOS measure the position of the planet to 15 arc seconds. This error is probably stemming from the solar bearing process. The position of Venus was averaging 0.004 degree more than the calculated azimuth, while the error in measured elevation was off by just a tad over five arc seconds. This definitely points at the solar bearing process because the error was consistently plus in azimuthal degrees. It is would be possible to improve on the solar bearing process by adding an attachment to the transit to narrow the solar disk. These devices may be available for the what transit is used. As always we hasten to add that One-eyed Jack says DO NOT look through the transit at the sun. Use a solar filter or project the image of the sun on a notepad. We tested the accuracy of the solar bearings and SHAMOS on Venus because it would have been folly to take a solar bearing of the sun and then test its accuracy by measuring the sun's position. Venus and other planetary positions less redundency in their position routines. Even though the planetary position routines use the sun's positions in their calculations. To test all of these routines the solar, lunar, and planetary positions have all been compared with the Astronomical Ephemeris in Right Ascension and Declination. These compare favorably within a few seconds of hour angle and declination. SHAMOS was written using the methods of Jean Meeus who sifted through all the positional terms for the planets and came up with those that remain most significant for position calculation in the present and over longer periods of time past, present and future. For validity check going backward in time Solarnetics has compared position data with Kepler cir. 1600 and Ptolemy cir. A.D 150. 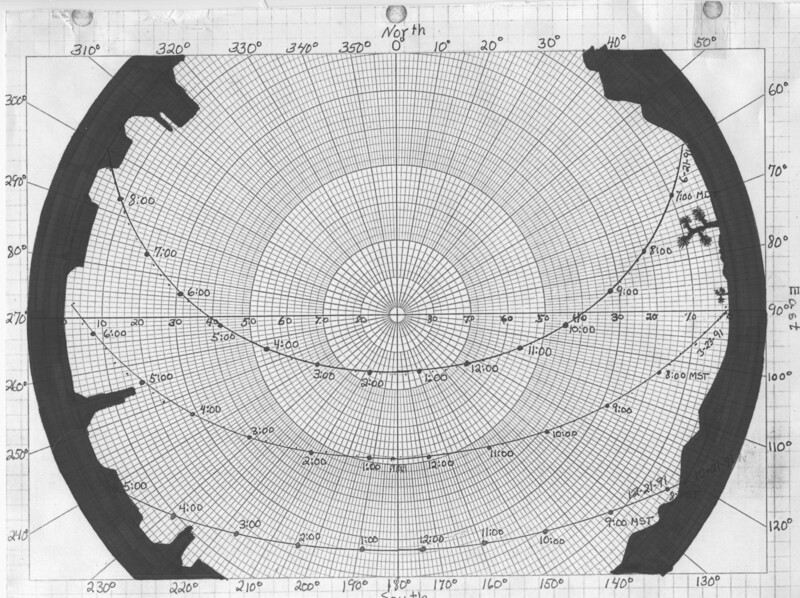 Below are the plots of solar motion over a site in the American Southwest for Summer Solstice, the Equinoxes and Winter Solstice. These were generated from a routine in SHAMOS that gives a table of solar motion for a whole day of the users choice. If a person is doing survey using the sun as a reference, this is an invaluable tool. When in the field, the surveyor can print this table and carry it with. When a transit is set up, the surveyor need never wait longer than fifteen minutes to get a fix on the sun.